Chengli Special Automobile Co., Ltd manufactures refrigerator trucks since 2004s in China. With so many years’ experience in manufacturing, we Chengli Special Automobile Co. Ltd could manufacture and sell vaccine delivery vehicle, meat hook refrigerated truck, fruit and vegetables refrigerated truck, milk food transport refrigerator truck, insulation van truck, van refrigerated truck, freezer minibus, small refrigerated truck, medium freezer van truck, big refrigerated truck, refrigerator semi-trailer, freezer refrigerated vehicles, dongfeng brand cold room truck, ISUZU brand refrigerated truck, FAW refrigerated truck, FOTON refrigerated truck, Chang’an freezer van truck, Yuejin refrigerated truck, JMC refrigerated truck, CMAC refrigerator truck, Aoling refrigerated truck, the smallest refrigerated truck, etc. More information, please feel free to contact with Ms. Anita. dongfeng 4*2 LHD 95hp 4m length refrigerated truck with double temperature controlling areas customized for client from Philippines is finished. 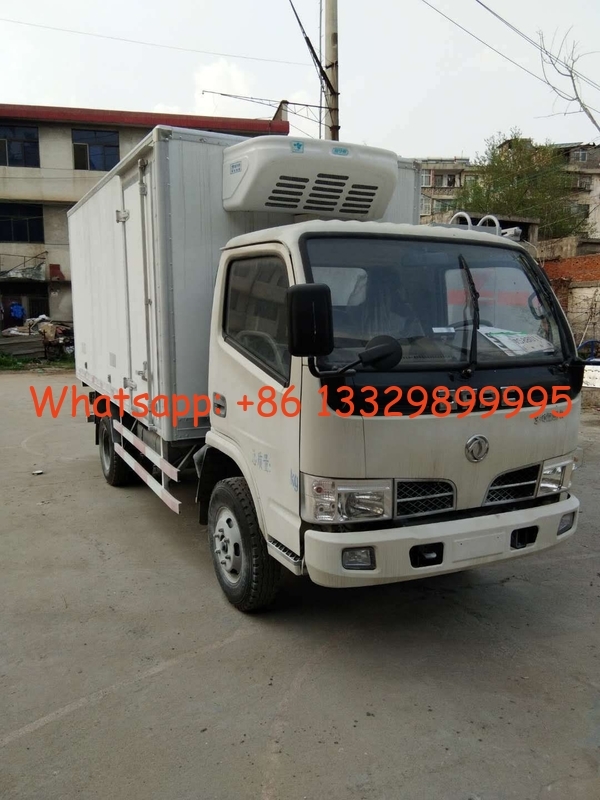 Dongfeng 4tons refrigerator truck, dongfeng light duty single row driver cab, 4*2 LHD, 3300mm wheelbase, chaochai 4102 95hp diesel engine, 5 speed gearbox, 7.00-16 nylon tires; cold room box dimension(L*W*H): 4000*1850*1800(mm), one movable clapboard inside the insulation body, dividing the cold room box into two separated areas(front area and rear area) and one side door at the front area; China-made Huatai brand dependent frozen cooling unit, adjusted from zero degree to 18 degree below zero, etc. If you're interested in our refrigerated truck, please send email to szhj9999@163.com or talk to Anita by Whatsapp/Wechat: +86 13329899995. Cold Room Box body There is movable clapboard inside the insulation body, dividing the cold room box into two area(front area and rear area).There is one side door at the front area. Box Side Exterior and interior with FRP( fiber reinforced plastic), and the middle with 80mm PU slices with vacuum negative pressure one-formed casting as the insulation layer. Cooling unit Dependent frozen cooling unit Famous China-made Huatai brand dependent frozen cooling unit, the temperature can be adjusted from zero degree to 18 degree below zero, etc. And the cooling unit can be adjusted at the driver cab. More information, please contact Ms. Anita.